If we’re being honest, there is nothing better than kicking our heels off at the end of the workday. From the moment we wake up to the moment we get back home, there is nothing we think of doing more. And who could even blame Us? There is no better feeling in the world than slipping out of our heels and into our slippers. There is nothing we love more than a slipper. They are our a shield of security for our feet. Nothing keeps them warmer, more comfortable or even more protected than slippers. In some ways, slippers are our safety net, shielding our feet from the outside world. So of course, what better brand than UGG to go ahead and make a shoe that feels like a slipper! Simply slip into this cozy shoe that feels like a slipper and go from the sheets to the streets in comfort! See it: Grab the UGG Cozette Genuine Shearling Slipper for $80, available at Zappos! Also available for $80 at Macy’s, and for $80 at Nordstrom! There is no brand more reliable than UGG. For years, the brand has been the cold-weather must-have that has been shielding and protecting our feet from just about every rainstorm, snowstorm or even life storm that comes our way. So of course, what better brand to introduce Us to our next must-have shoe? 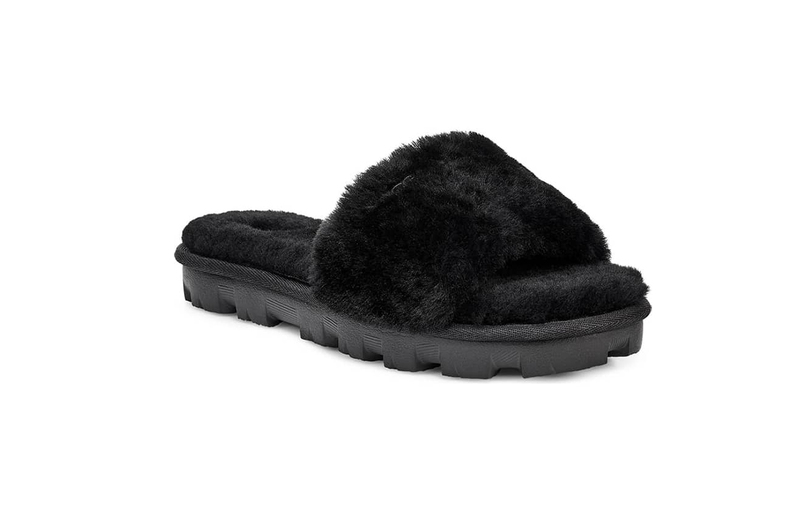 The UGG Cozette Genuine Shearling Slipper is the softest option, ever. Our eyes were instantly drawn to this plush sandal! This design has such a fun and cozy twist on our go-to warm-weather favorite silhouette. Crafted from plush genuine shearling and UGG’s signature pure wool, the Cozette is not just the option that looks soft, it actually is soft. This warm-weather shoe also features a gripper rubber tread and low heel platform. Talk about not just being the perfect plush slipper. It’s actually the perfect plush platform! It’s a no-brainer that such a chic and comfortable slipper would leave shoppers swooning. Across the board, this slipper has near-perfect reviews from happy shoppers. Reviewer after reviewer was left beyond impressed with the high-quality slipper. One reviewer pointed out that this shoe was beyond wearable. From hanging around the house, running errands or even going out at night, this shoe was the perfect staple, according to one reviewer. So many shoppers similarly echoed this reviewer. Much to our liking, so many other reviewers brought up another point that we actually failed to realize until now. With so many of Us already being longtime lovers of the UGG brand, the brand’s collections are already near and dear to our hearts. One reviewer loved how this was a more seasonably-appropriate option when looking to transition out the infamous UGG coquette. The open-toed, exposed sandal was the perfect update. Let’s be honest, with the five fabulous shades up for grabs, we can hardly blame any of the reviewers! When selecting between the black, natural, oyster or pink dawn options, every sandal is just as sensational as the last. For those looking for the most eye-catching of the punch, the pink dawn would be the best shade option. It will pair fabulously with all of those minidresses, full head-to-toe monochromatic white outfits, rompers and even two-set coordinates! The pink shade is just perfect when looking to brighten up wardrobes, outfits or just our feet! The other three colors are just as divine, too! When looking for the most basic of the bunch, we’d recommend the black. Make no mistake though, it’s anything but basic because it will actually elevate any outfit. Whether looking for the no-stain commuter shoe, the perfect weekend ready-to-wear option or even just a new must-have, the black is the best! From cropped hoodies to black leggings to even short minidresses, the shoe will seamlessly transition into any and every outfit. When looking to chose a more neutral tone shoe option, the natural or oyster would be the best bet. The natural option is the closest to a white or off-white shade. It’s almost a yellow-beige-white. It looks perfect when paired with any pattern or printed outfit! Just as perfect? The oyster, of course! If brown and grey were to make a color, it’d be this color. It’s so smoky and rich. It would be ideal when looking to pair with those darker wash denim jeans or with those pinstripe jumpsuits. 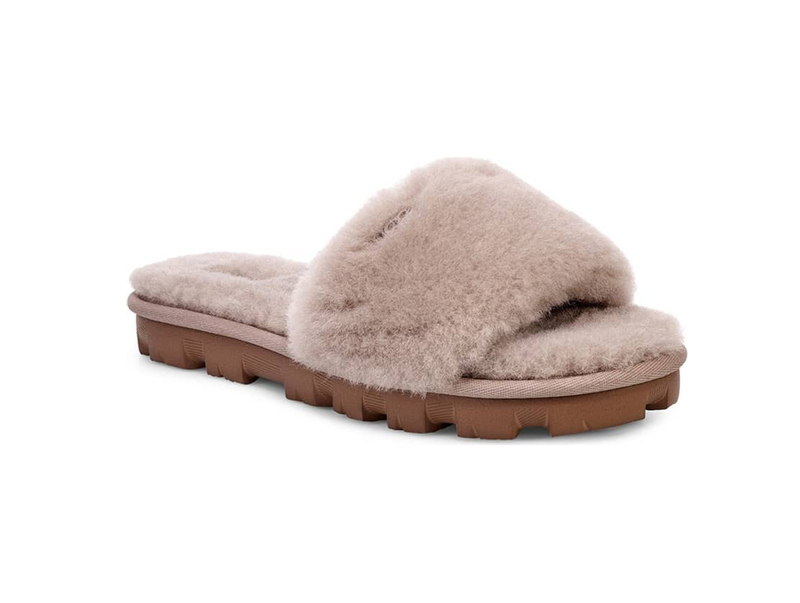 For those looking to slip into the fluffiest, softest and the plushest option on the market, we’d highly recommend sliding in the UGG Cozette Genuine Shearling Slipper! Not your style? Check out additional UGG options also available at Zappos!